The pattern drawn is very large for kutchwork. The kutchwork looks best when worked in small scale. It is better to use the appropriate thread size. But here , the thread used is perle cotton #8. This is for the sake of tutotrials. 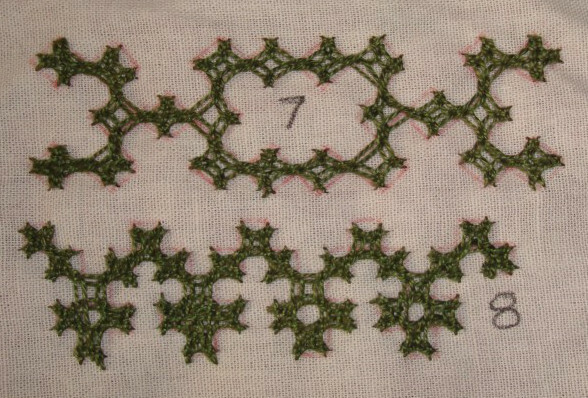 Starting with the anchoring stitch. The thread goes over the previous line. Again the thread goes over the previous line. 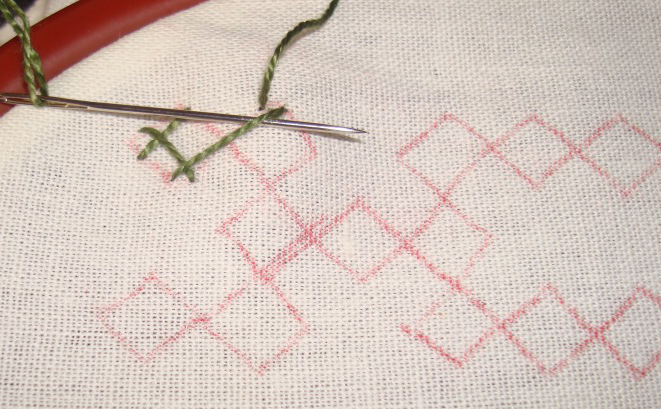 For the next square, after working the stitch, the thread goes under the line. The thread movement alternates like this for adjacent squares. The same way, the thread goes under the line again. We moving from one square to another, repeating this movement. Remember to go under or over the already worked lines, based on the previous position of the thread. We are crossing over to the next part [the four by three rectangle], in a continuous border, we will be moving along the border till the end, in this sample however, we will complete the anchoring working from the other side. On tip- when working in anticlockwise direction, we go over the previous thread. When working in clockwise direction we go under the previous thread. This might be helpful, when we are crossing adjacent squares. This tip is useful only when the steps are worked this way. If someone is using another method easier for them, do not get confused. 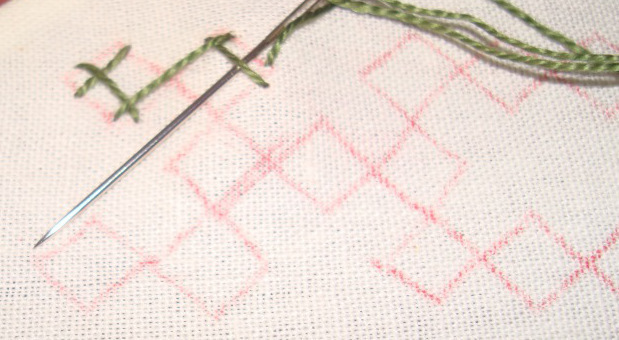 The skipped squares will be completed when worked from the other side. The last stitch to complete this part of the anchoring. The other side is worked in the same way. Now to start the interlacing. This is simple interlacing, the perfect filling is, after the interlacing the fabric should be completely covered. With this big size pattern and smaller size thread, it is not possible. Still it is better to remember that. The inner side of the rectangle needs to be inter laced separately in this border. This type of separate interlacing varies from pattern to pattern, which is what makes the kutchwork very interesting. The horizontal bars need to be anchored separately in this pattern. We will just move for square to square without skipping any square in between, that makes this an easy pattern. Still we have to go under or over alternatively, the already worked horizontal bars. In this pattern the area around the horizontal and crossed vertical bars, needs to be interlaced separately, because that part does not automatically follow the continuous interlacing. It is left hollow. 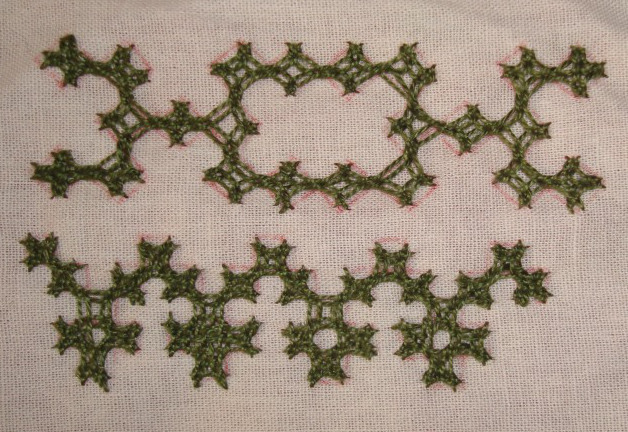 Instead of interlacing, this part is woven to show it is possible in this pattern. Lovely patterns, will make excellent edgings. Thanks. Thank you, Meena, I too hope. ideas keep coming, glad I could work some border samples.